The world elk calling championships are always thrilling as the scream of the bull elk bounces off the convention center walls delivering chills up everyone’s spine. All of the participants are friends and we cheer each other on as they step on stage for the “blind” sound off. It is such an honor for me to share the stage with the best lady elk callers in the world and this year, the ladies division was extremely competitive with Misty Jacobsen taking the well deserved 1st place as a 10 time Women’s division World champion elk caller with 158 points, the 2012 world champion, Jessi Diesing took a close 2nd place with 155 points and I rounded out in 3rd place with 154 points. On stage Misy and I both were proudly using Rocky Mountain Hunting Calls elk calls as her father and my good friend, 4 time World Champion elk caller Rockie Jacobsen is the manufacture of those calls. 1. Bryan Langley, McMinnville, Ore.
2. Corey Jacobsen, Boise, Ida. 3. Rockie Jacobsen, Kamiah, Ida. 1. Misty Jacobsen, Marina, Calif.
2. Jessi Diesing, Loveland, Colo.
3. Kristy Titus, Bend, Ore.
2. Chris Griffiths, Kila, Mont. 3. Brad Cain, Mesa, Ariz.
2. Russell Nemetchek, Saskatoon, Sask. 3. Paul Griffiths, Kila, Mont. 1. Greg Hubbell, Jr., Belmont, Calif.
2. Brayden Langley, McMinnville, Ore.
3. Elias McMillan, Grand Junction, Colo.
1. Isaac Jacobsen, Boise, Ida. 2. Sutton Callaway, Maricopa, Calif.
3. Kason Hulsey, Eagar, Ariz.
2. Rockie Jacobsen, Kamiah, Ida. This year was the first ever “Champion of Champions,” an invitational elk calling contest featuring previous winners from the professional division from the fist 25 World Elk Calling Championships. 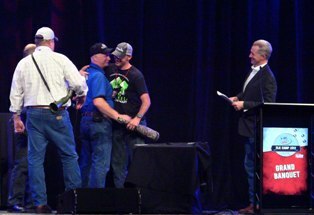 The champion winner was crowned with an elk hunt from Opal Butte Outfitters in Oregon to be filmed for Outdoor Channel’s television show Team Elk. The first ever Champion was Corey Jacobsen, a close second was his father Rockie Jacobsen. On stage is what elk hunting and elk country is all about; a father who has mentored and taught his son, continuing the legacy that we all love, on stage side by side. The best gift for Corey was watching his own sons on stage calling and his son Isaac was even crowned champion of the Peewee division. I am sure that Rockie felt the same sense of pride when Corey was donned champion of champions. 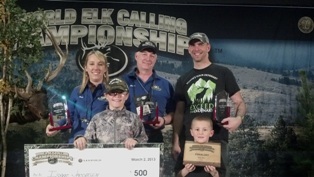 With seven top finishes, the Jacobsen’s are truly the “First Family of Elk Calling”.